Eastern Wyoming College is pleased to announce the honor rolls for the Spring 2018 semester. There were 97 students receiving recognition for achieving high scholastic grades. The President’s Honor Roll recognizes students that are full-time (12 or more credit hours) and achieve a 4.0 grade point average. To qualify for the Dean’s Honor Roll, students must also be full-time and achieve a grade point average of 3.5, but less than 4.0. The Eastern Wyoming College Foundation is accepting entries for the 2018 golf tournament to be held on Saturday, June 16th at the Cottonwood Golf Course in Torrington, WY. The four-person scramble will begin with a shotgun start at 8:30 am. The registration deadline is June 14. The entry fee is $300 per team which includes one team mulligan, a barbeque dinner and Calcutta. The dinner and calutta will be held at 6:30 pm, June 15th. Several gift certificates and hole prizes are available at this tournament. Proceeds benefit EWC students through the EWC Foundation in the form of scholarships, grants and other activities. Entry forms are available at Platte Valley Bank, Cottonwood Pro Shop or the EWC Office of Development. Questions about the tournament may be directed to the EWC Office of Development at 307.532.8397. 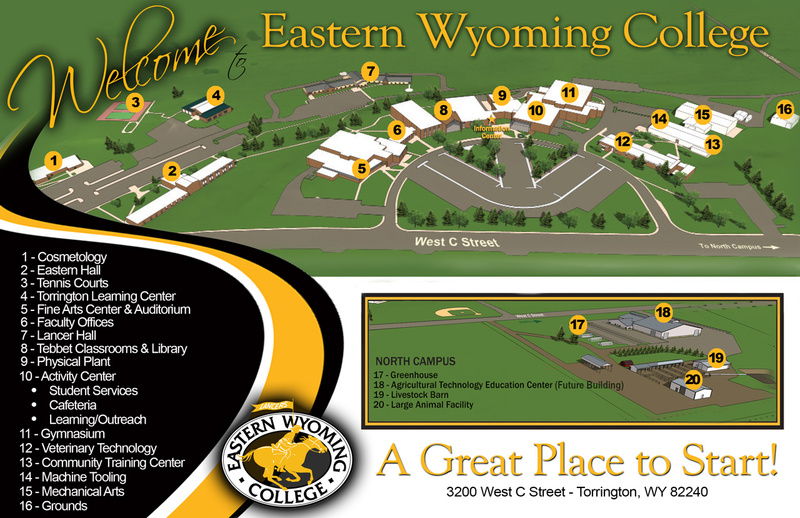 Eastern Wyoming College in Douglas announces summer hours 8:00 am to 4:00 pm Monday through Thursday and 8:00 am to 1:00 pm on Friday beginning May 14 through August 10, 2018. The Veterinary Technology program at Eastern Wyoming College has received notification from the American Veterinary Medical Association (AVMA) that the program has received full accreditation. For more information on the Veterinary Technology program at the College, please contact Dr. Walker at 307.532.8279 or by email at susan.walker@ewc.wy.edu. The Community Education office at Eastern Wyoming College in Torrington announced time change for the Zumba class scheduled to begin June 4, 2018. The class will be held on Mondays and Wednesdays, June 4 through August 1, from 7-8:00 am. To register for this class or other classes, contact the EWC Community Education office at 307.532.8323 or stop by 3200 West C Street in Torrington. Eastern Wyoming College officials have announced that Glen Morovits has been hired to develop and kick off the new Gunsmithing program as the lead instructor. The new program will begin Fall 2019 at the Douglas Campus. Morovits will begin his duties January 2019. Morovits has 30 years’ experience in the firearms industry manufacturing gunstocks (both high volume and high quality) as well as knife making experience. He is a charter member of the American Custom Gunmakers Guild. He is presently working as an Associate Professor, gunsmithing instructor, at Trinidad State Junior College in Trinidad, CO, where he has worked since 2013. Prior to that he owned and operated Morcco Inc. in Newell, SD, which was established in 2001. Morovits received an associate of applied science degree in Gunsmithing in 1981 from TSJC. Once on board, Morovits will work on acquiring the necessary equipment, further developing the curriculum, and recruiting students. Applications for the new gunsmithing program will be accepted beginning in 2019 with enrollment and classes beginning in the Fall 2019 semester. Students interested in acquiring more information on the program can contact Mr. Roger Humphrey at 307.532.8261. NJCAA Division I finalists for the Dave Williams Award presented by Golf Pride Grips have been announced by the GCAA. The Williams Award honors the national coach of the year in NJCAA Division I men’s golf.